What a great day I had Monday! To start off, my owner stayed home for the day. I love it when she does ’cause we spend so much more time together. Then it was raining, which I love because of the mud potential. But the best part was that I got to go visit a school. I hadn’t done that in a long time and I’d forgotten how fun it is. 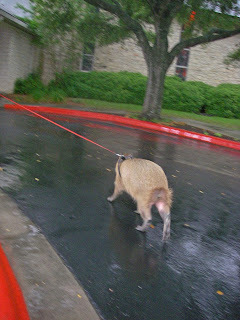 Walking up to the school in the rain. 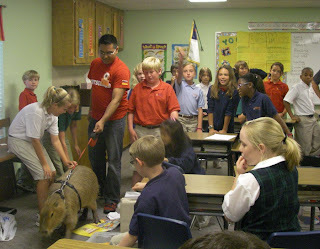 I went specifically to visit a fourth grade class where a student had done a science project on capybaras. What a lucky girl! It makes me wish I could really attend school instead of just visiting but I don’t guess that’s an option. Sheldon, my owner and I all checked in at the school office and met our student’s mother and her friend. Her friend fed me an apple. I don’t know why my owner doesn’t do that. Well, maybe because I wouldn’t eat it last time she gave me one. But you have to keep trying. Eating an apple in the office. I made a big splash in the office. Naturally everyone loved me. Then we had to climb some stairs up to the classroom. 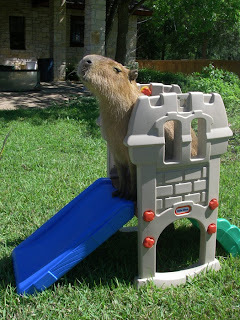 I am surprisingly good at going up and down stairs. 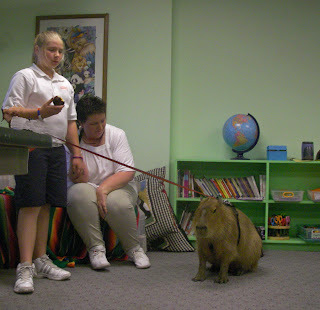 Once in the classroom, our student gave a short introduction to capybaras (good job, Skyler!). Then my owner did a question and answer session. Look how cute and good I am being. Here are some of her questions (answers at the bottom). 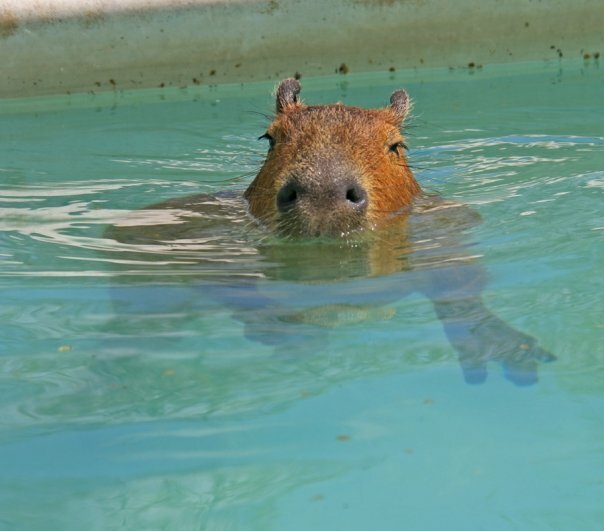 What are the major predators of capybaras? 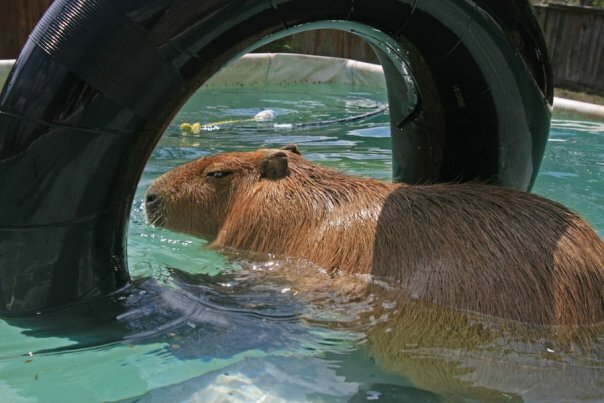 Where do capybaras live in the wild? 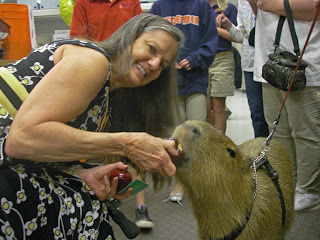 What’s special about capybara teeth? 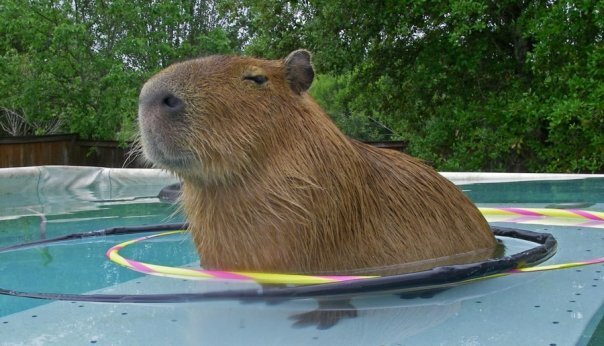 What is the second largest rodent? 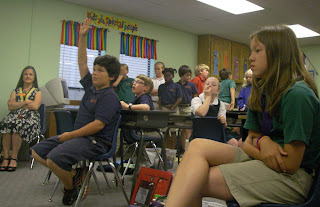 The kids loved answering the questions. The kids did great and I think they learned a lot. 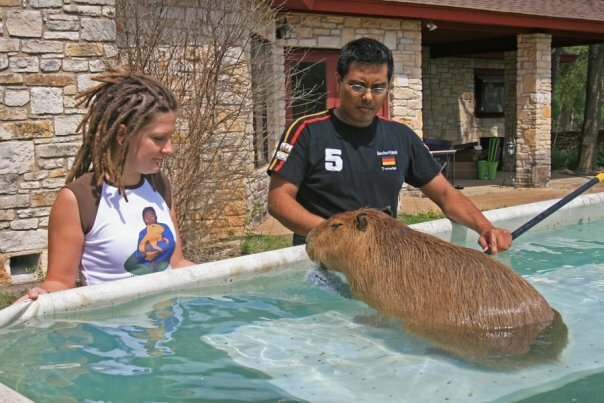 The thing they learned the most was that capbyaras are not just the largest rodent in the world, we are also the cutest. When it was almost time to go, the original class filed out and a new one filed in. They didn’t get much time with me so I felt sorry for them. Then on the way out, we stopped to visit with an eighth grade class. We were in the front of the school so other kids wandered by and I got mobbed a little bit. But I kept my cool. My owner gave a bunch of kids fresh blueberries so I just kept searching from hand to hand to find them. Some kids stuck out their hands when they didn’t have blueberries and that seemed a bit dishonest but I guess I can’t blame them. A strange thing happened this week: my life was changed by a photograph. 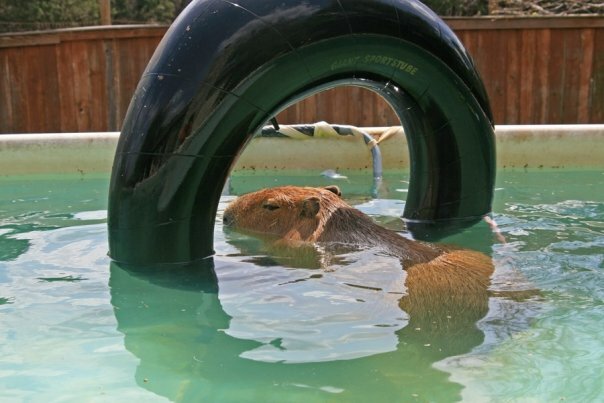 I have some capy friends in Houston to blame for this. Their owner posted some photos of them on his FaceBook page and my owner saw it and seized on it. It became an obsession with her. Below you see one of the original photos. 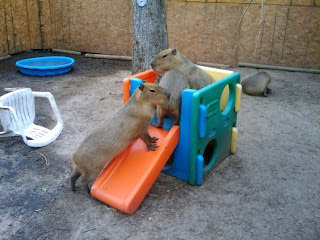 Houston capys playing on their toy. 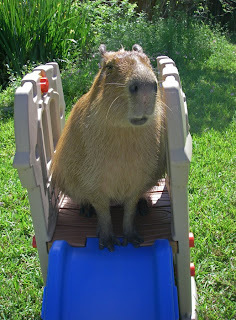 For the next two days all my owner could talk about was how she was going to get one of those contraptions for me! Really, I am way too dignified for that. 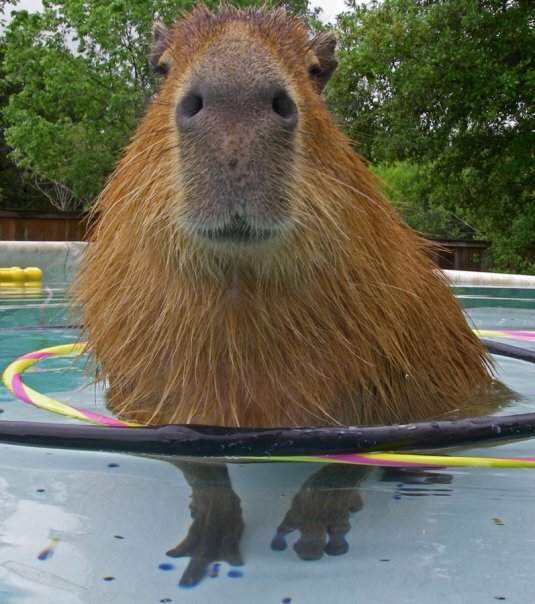 Those Houston capys don’t have any class. But my owner would hear none of it, even though I eeped rather loudly. She searched the interweb. She scoured local stores, even those she hates like Target and WalMart. When she didn’t find what she wanted, I thought she would give up. But no, she settled–and therefore I settled–for less. She got me the dumb contraption you see me sitting on below. I should have know this was going to go badly for me. It is supposed to be a castle but it did not make me feel like a king. 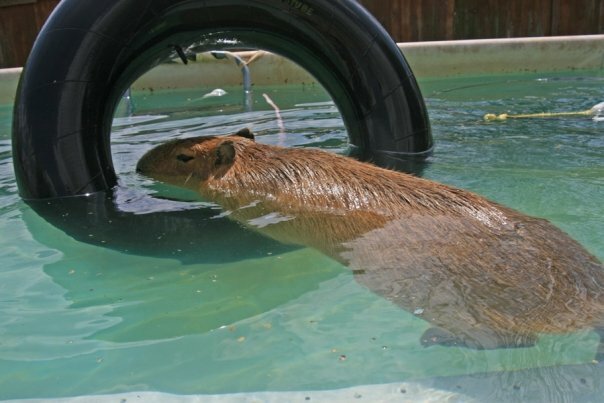 The Houstonian version is large enough–barely–for three capys. I hardly fit on this one by myself. And it doesn’t have the same cute colors or holes for climbing through. But that didn’t stop my owner. Next thing I knew, a popsicle was dangling in front of my face. When I went to grab it with my teeth, it moved farther from me and closer to that castle. Eventually I was sitting on it. Believe me, I am not as content as I look! Getting onto the platform was only worth 1/2 of a popsicle, if you can believe that. 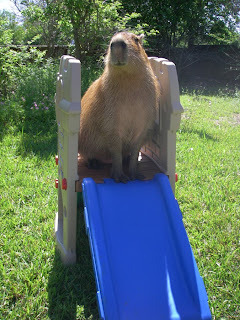 Amazingly, she expected me to willingly step onto that slippery blue slope and slide down! I resisted as long and as hard as I could but she still had that darned half of a popsicle and I wanted it! She’s dangling a popsicle just off-camera! Can’t I just do a circle instead? 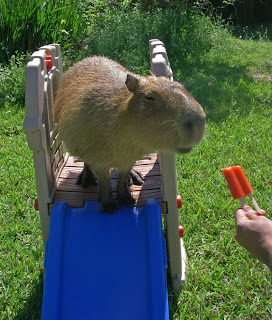 I couldn’t let that popsicle go. Eventually I put one paw out and that was the end of it. Down the slide I went. 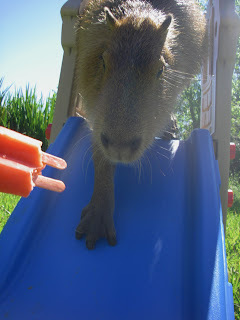 My owner gave me the other half of the popsicle when I got to the bottom and, I have to say, it was delicious. The problem now seems to be that I can’t get a popsicle unless I climb up into the castle and slide down the other side. How do these things happen to me? Do I have a food addiction? Is my owner insane? What will she think up next? Here’s a link to my YouTube video video of my very first slide. And if you missed me on Animal Planet, we’re into reruns. My first trip down my new slide. 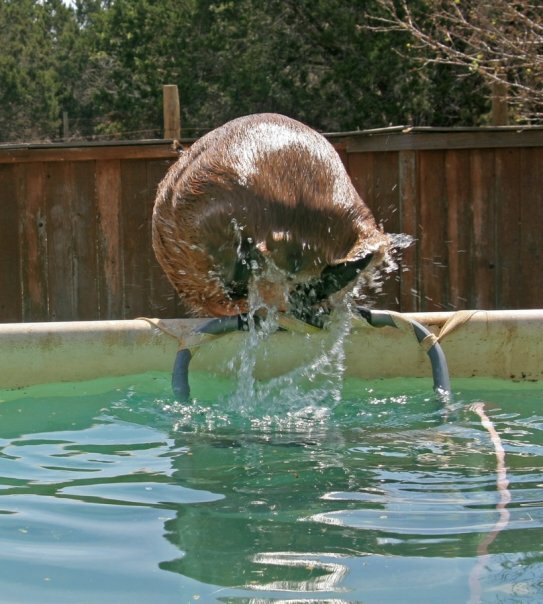 I show off my teeth and tongue as I eat grass in the pool.